In round 42 of the Czech Extraliga's 52-game schedule, the playoff race is really beginning to heat up. The top 10 teams make the playoffs, and teams nine through 12 took to the ice against each other Tuesday night. 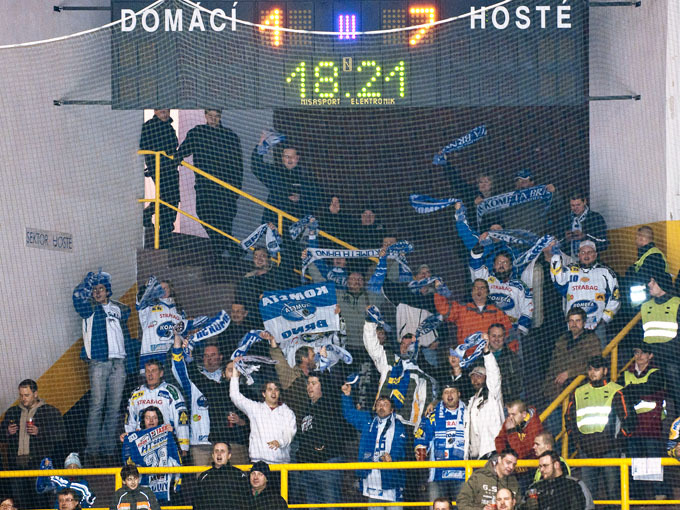 For these Kometa Brno fans, the trip to Litvínov was well worth it. 12 games ago, HC Kometa Brno was tied for third place and had its eye on top spot, but they've only won once since then and found themselves in danger of falling out of a playoff position as they took to the ice in Litvínov against HC Benzina. They picked an opportune time to break out of their slump as they struck for three goals in the first period, all of them assisted by Ivan Huml, en route to a convincing 7-1 win over Jiří Šlegr's squad. Meanwhile, 11th-place HC Plzeň 1929 hosted 12th-place HC Sparta Praha. Plzeň got two first-period goals from Radek Duda, and that's all the offence they needed, as Luboš Horčička stopped all 27 shots he faced in a 2-0 victory. John Lammers of Langley, BC and Nick Johnson of Windsor, CT, who are flatmates in Plzeň, were re-united on the same line for the first time after over a month apart. They responded with a solid defensive effort. With the win, Plzeň leap-frogs over Litvínov into 10th place, and a playoff position; an amazing accomplishment, considering they were stripped of 19 points in November for dressing improperly registered players. If they hadn't lost those points, they would currently be tied for third place. In the Extraliga's current playoff structure, the top six teams in the regular season advance to the quarter-finals, while teams seven through ten play best-of-five series to determine the last two quarter-final berths. With the possibility of facing a red-hot Plzeň team, who are not really a 10th-place club, teams have extra incentive to try to finish in the top six, which made Tuesday's match-up between sixth-place Slavia Praha and seventh-place Mountfied České Budějovice interesting. Slavia held a one-point lead, but Budějovice won 3-0 on home ice to pass Slavia and slide into sixth position. At the top of the standings, Vítkovice Steel fell out of first place when they lost in Liberec to Bílí Tigři by a 4-2 score. Oceláři Třinec also beat BK Mladá Boleslav 5-2 to pass both teams and claim top spot, knocking Vítkovice into third. Rounding out round 42, PSG Zlín shut out Vagnerpast Kladno 3-0 and Energie Karlovy Vary knocked off Eaton Pardubice 4-1. All teams now have 10 games to play, except for Benzina Litvínov and Sparta Praha, who each have 11. The game in hand will benefit Litvínov more than Sparta. Litvínov now sits in 11th, but only one point out of a playoff spot, but Sparta is 10 out and needs a major reversal of fortunes to get back into the playoff race.